When we made the decision to buy an old house, we automatically entered the world of renovations. A totally new world for me. When we made the decision to live in the house while it was being renovated we automatically signed ourselves up for some inconveniences. Nothing major, all very livable, but because of the duration of these inconveniences it can get rather annoying. The most visible inconvenience is the dust. Every household has its fair share of this grey substance in day-to-day life. But here, it tends to come down in thick clouds as soon as you pick up any tool. And even when tools are doing their work in another room, with all doors tightly sealed, it will find a way out. Table tops, lamps and cupboards are all covered in a lighter shade of pale. I’m afraid to admit that I've gone on permanent dusting strike. It is no use trying to keep up and have dust free house. Another inconvenience can be the usually uneventful visit to the loo. It can even prove to be a real adventure. First of all, the road that leads to the one loo in the house may be treacherous. With work going on in every room, there might only be one entrance, the one via the backdoor (next to the loo). 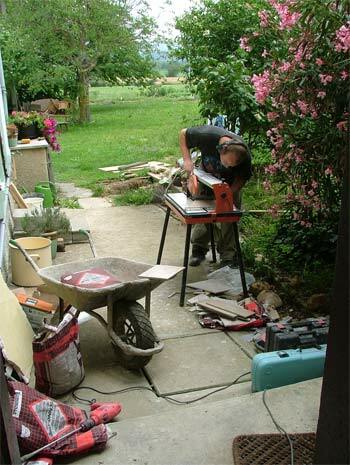 Once in the toilet area, having safely dodged dangerous tile cutting machines, low flying extension leads, cement mixers and other hazardous equipment, you realise that your visit might not be as private as you preferred. Sound and smell do go noticed by the workers that work just half a meter away from you! Timing in this case is important and noisy machines are a god send. It all becomes more of a daunting visit when the water has been cut off and the reservoir has been nicely emptied by previous visits. And what to do when the bucket of water we thoughtfully filled beforehand proves to be too heavy for those with temporarily soar backs….. Then it is time for a more natural bodily function elsewhere. With 7 hectares and the corn growing at a steady pace this is easy, but watch out for the snake! Work on the water pipes in the kitchen is also a delight. Just the simple task of making coffee can then be an interesting chore. First of all, at the beginning of the day, and before the water supply is turned off, remember to tap enough water for washing hands and making tea and coffee. 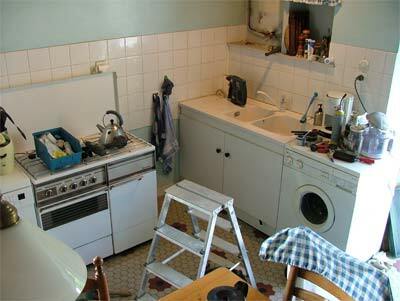 Then, at coffee time, try and locate the machine and its other requisits in the mess that is now your kitchen. Making sure you don’t break your neck over stray water pipes, toolboxes, puddles on the floor and a plumber whose bottom is sticking out from under the sink, find a suitable and safe space to plug in machine by unplugging machines that are in use by the plumber. And then, most importantly, don’t get called away and make sure you DO place the coffee can under the filter… it has happened a few times that coffee ended up everywhere else but in the can. “Whaaat? “Can’t hear you, say that again?” “Sorry, there is too much noise here, can I call you back?” It sometimes is so bad, you can’t hear yourself think. Deliberation on the work floor is often rudely interrupted by all sort of sounds. The worst of them all is the grater to sand off “Siporex” blocks. This sounds like nails scratching over a blackboard. Still, the mess, the noise, the infinite moving and shifting of the same stuff, the early mornings, the endless discussions and makings of yet another version of a floor plan, the continuous disturbances, the dirt, I wouldn’t want to miss it. It only adds to the intense experience of living in, owning and taking care of our own old farmhouse. © 2006 Perry Taylor and La Baguette Magique.